This photograph of one of Canada’s most exquisite glacier-fed lakes was taken close to sunset at the start of the Canadian summer. 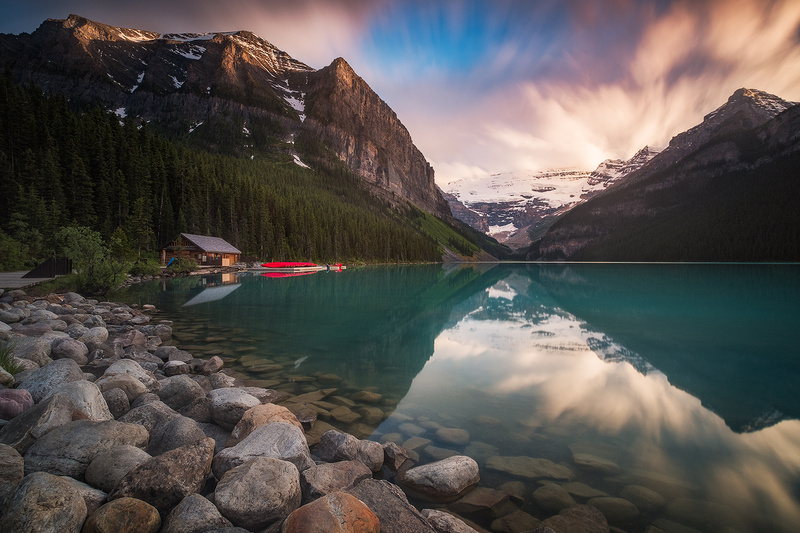 “Lake Louise” is actually the name of the hamlet ringing the lake, and is nestled just west of Calgary, beside the Trans-Canada Highway. Three of the most dramatic peaks Canada has to offer fringe the hamlet and provide a bewitching backdrop to the already alluring turquoise waters of the mirror lake – Mount Temple, Mount Whyte, and Mount Niblock.